When we need to send source code, notes or any other kind of text information to another computer we can normally copy-past it into MS Word or Notepad, save that file in a pen drive and carry it to another computer. Or in case if we need to share it with someone on internet you can simply send them via email, IM, Facebook Massages, etc. But if you want to share text with large number of people over internet then there is a web application called PasteBin. PasteBin lets you share any kind of text online with anyone. It is basically made for programmers who always need to share source code of their project with a group of people or with unknown people online. You can also use to it to share more than 140 characters on Twitter, simply type your text and create a paste then type the snippet of that text in Twitter and at the end add PasteBin URL. When you will create a paste you can select which syntax highlighting should be used (if you are create paste of any programe), set paste expiration time, it will be public or not (you will only able to view it) and give the name of your paste. You will able to add 512 kilobytes (0.5 MB) of text per paste, I think it is more than enough for any script, in case you need more you can create two paste else you can buy there PRO pack which let you add up to 10 MB. It supports syntax highlighting for about 200 languages (includes HTML, CSS, JS, C, PHP, MySQL, Java, Autohotkey, VisualBasic, etc.). 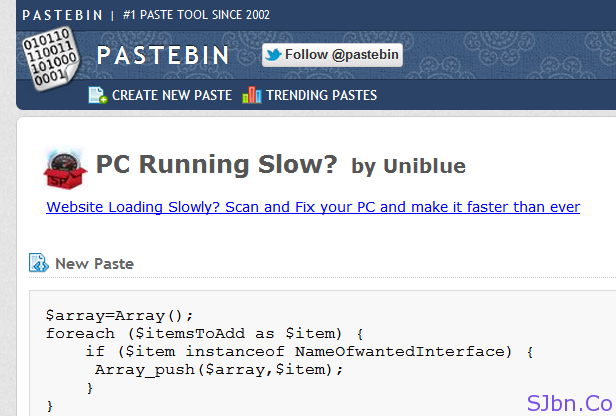 In many cases pastes which are created in PasteBin stays for a month but in some cases it can be removed within a minute or it can be there for infinite amount of time. After 8 years, Pastein surpassed ten million active pastes (not spam or expired pastes). PasteBin is available as Desktop application, Extension, Add-on, Mobile App, etc. you can download it from there tools page. It also shows trends of pastes which update every hour, stats of new paste created.